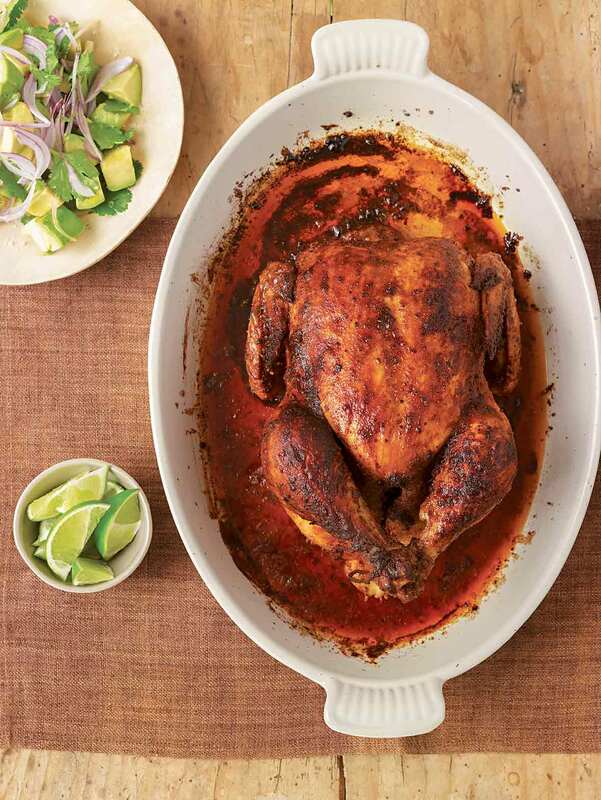 This Peruvian roast chicken borrows its accent from a marinade of paprika, cumin, and garlic, which results in the dish’s amazing orange hue. 1. Finely chop the garlic cloves. Using the flat side of the knife’s blade, scrape and chop and mash the garlic and 1/2 teaspoon of salt into a paste. 2. Pull off any excess fat surrounding the cavity of the chicken and discard it. Rinse and pat the chicken dry, inside and out, and place the chicken on a plate. Rub the chicken all over with 2 of the lemon quarters, then discard the lemon quarters. 3. Slip a finger under the chicken skin at the edge of the cavity and run it along the breasts and thighs to gently loosen the skin. Gently work a little of the garlic paste between the chicken skin and meat, being careful not to tear the skin and rubbing your hand along the surface of the skin to smooth the paste and push it past where you can reach with your hand. 4. In a small bowl, whisk together the vinegar, 2 tablespoons of the wine, the oil, paprika, cumin, black pepper, and oregano. Place the chicken in a 2-gallon resealable bag or a baking dish and pour the marinade on top. Turn the bird several times to coat. Seal the bag or cover the chicken and refrigerate for 5 to 8 hours, turning the chicken once or twice if you think of it. 5. Preheat the oven to 425ºF (220°C). Adjust the oven rack to the middle position. 6. Transfer the chicken to a baking dish or heavy frying pan (see LC Note preceding the recipe), pouring the marinade into a small bowl and scraping any thick bits of spices that cling to the container into the bowl. Squeeze the 2 remaining lemon quarters into the cavity of the bird and toss the lemon quarters into the cavity. If desired, tie the legs together with kitchen string. Season the chicken all over with 1 teaspoon of salt. Set the reserved marinade aside. 7. Roast the bird in the oven for 15 minutes, then baste with some of the marinade. Reduce the heat to 375ºF (190°C) and continue to roast, basting every 20 minutes with the marinade and the pan juices, for an hour. Discard the marinade. Then roast for 15 minutes more, for a total of 1 1/2 hours, until the juices of the chicken run clear when the thigh is pierced with a fork and an instant-read thermometer inserted into the thickest part of the thigh reads 165ºF (74°C). Allow the chicken to rest for a few minutes after you remove it from the oven. 8. A little while before you take the chicken from the oven, peel and halve each avocado. Remove the pits and cube the avocados. Place the avocados, onion, cilantro, lime juice, oil and a generous pinch of salt in a bowl and toss to coat the avocado with lime juice. Set aside to allow the flavors to meld. 10. Carve the bird, toss the avocado salad once again, and pour the pan sauce into a serving bowl to pass on the side. 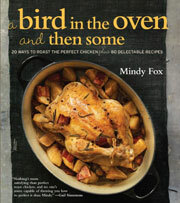 Peruvian Roast Chicken Recipe © 2010 Mindy Fox. Photo © 2010 Ellen Silverman. All rights reserved. All recipes and photos used with permission of the publisher.